Nov. Actorum Acad. Caes. Leop.-Carol. Nat. Cur. 16(1): 326, pl. 18 1832. 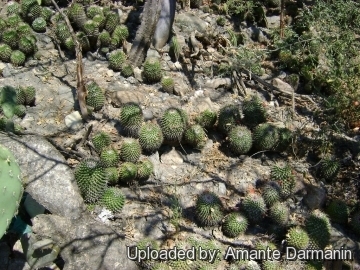 Growing habit Near Cuicatlan, Oaxaca, Mexico. 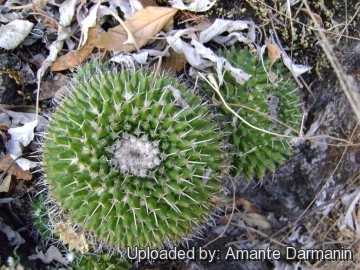 Origin and Habitat: Mammillaria polyedra is endemic to Mexico, where it is known to occur in the States of Guerrero, Oaxaca and Puebla. Although it has a relatively restricted range (extent of occurrence less than 20,000 km), the species is locally abundant. Altitude range: 900 to 1,900 metres above sea level. 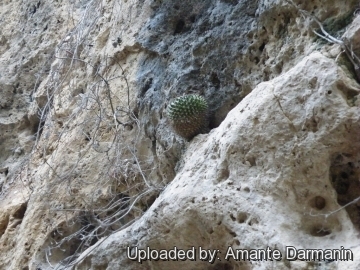 Habitat and Ecology: This cactus grows in tropical deciduous forest where it often and occurs in huge colonies. There are currently no major threats to this species. 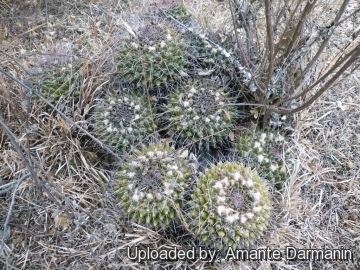 Description: Mammillaria polyedra is a low growing cactus, solitary at first, later branching to form colonies or cushions. It can only be identified when in flowers, because in its vegetative state it is difficult to separate from other species in the polyedra group. Stems: Globose to short cylindrical or somewhat thicker above, deep green, to 30 cm high, 10-12 cm in diameter. Tubercles: 12 mm long, pyramidal, flattened dorsally, 6- or 7-angled, pointed with latex; axils of tubercles with wool and bristles. Radial spines: 4-6, ascending, straight, short, brownish yellow or greyish with purplish tips, 6-25 mm long, upper ones longest and strongest. Fruits: Wide, club shaped, red. 5) Arias, M.S., Gama, S. and Guzmán, U. 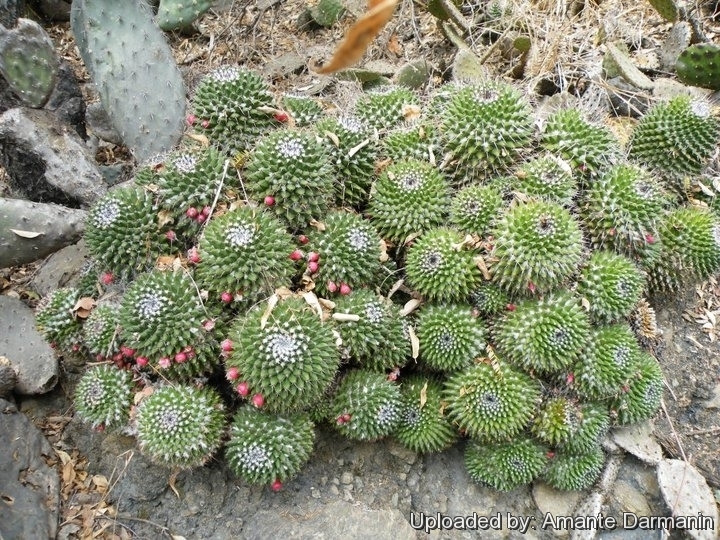 “Flora del Valle de Tehuacán-Cuicatlán”. Fasículo 14. 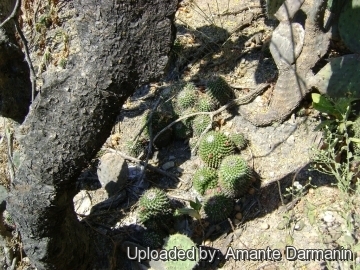 Cactaceae A.L. Juss. Instituto de Biología, UNAM, Mexico. 1997. 6) IUCN. 2013. “IUCN Red List of Threatened Species” (ver. 2013.1). Available at: http://www.iucnredlist.org. (Accessed: 12 June 2013). 7) Jiménez-Ramírez, J. M. Martínez-Gordillo, S. Valencia-Ávalos, R. Cruz-Durán, J.L. Contreras-Jiménez, E. Moreno-Gutierréz & J. Calónico-Soto. “Estudio florístico del municipio de Eduardo Neri, Guerrero”. Anales del Instituto de Biología, Serie botánica 74: 79-142. 2003.